Stop! in the name of glove, before you make me sick. Think it o-over. Wash hands properly (20 seconds) before putting on the gloves, or changing to a fresh pair. Know when to hold ‘em, know when to change ‘em. If gloves become dirty, change them. If you change tasks, change gloves. If you see a rip or a tear in them, change them. If you manage to keep them clean looking and intact, but have had them on for four hours, change them anyway. And, ALWAYS change them after you touch raw products, if you are going to be touching cooked items. Did you pick up the chicken salad recipe in order to read it better? Hey, you are preparing a “ready to eat”(RTE) food – and you just contaminated those gloves! I know the recipe card did not seem dirty, but unless it was sanitized, you cannot be touching it with the gloves that are protecting the RTE food. Sometimes we have the illusion that those gloves are protecting us from messy foods. We need to remember they are protecting the food from us. We, as the food service worker, are responsible for most cases of foodborne illness. Shame on us! If you opened the walk in cooler while wearing gloves, you have to change them before you go back to work. Think of that handle in this way. If I could pop the handle off, and I used the underneath side of it to serve you some diced up chicken, would you eat it? I bet you wouldn’t. But, when you touch the chicken salad with the same glove that touched the walk in handle, the effect is the same – contamination from a piece of equipment to a RTE food. I could go on and on. When you touch the trash can, move an empty milk case, take a tray or some other item back from a student that has been touched by his hands… pretty much any task you do that is not just serving, or food prep of the same item, invites contamination. When this happens, remove gloves properly, peeling them off from the cuff, turning them inside out in the process – trapping those blasted contaminants – and discard them. Never wash or reuse food service gloves. Disposable means disposable. So, if Glove is the Answer, what was the question? Well, it wasn’t the one I asked earlier. You should not be wearing gloves when you handle the produce that needs washed. It could be contaminated; that is why we wash it. You should wash produce with clean bare hands or with a clean brush if the item has a thick skin. Rinse, don’t soak, the produce in this process. The idea is that while you are cleaning the produce, you are also decontaminating your hands (remember, you washed your hands before you started, so you did not introduce new contaminants into the process). Now that you have washed these items, place them into a sanitized container or surface. Voilà! You have just transformed the produce into a ready to eat food! You can no longer touch it with your bare hands. …But, do you have to wear a glove? Glove is all you need…. Actually, it isn’t all you need, and there is no law that says you have to wear a glove. What the food code says is that there is “no bare hand contact” with RTE foods. There is actually quite a debate raging within the ranks of food safety professionals. Many, who know the most about the spread of viruses and microorganisms, feel that proper hand washing, and the use of a different barrier between the hands and the food – such as tongs, serving utensils, deli paper sheets, etc., are far more effective. They argue that gloves are often contaminated long before they are changed, and that the person wearing them has a false sense of being clean. If he was not wearing gloves, he would likely recognize points where he should wash his hands, yet he does not stop to change gloves at those same points. 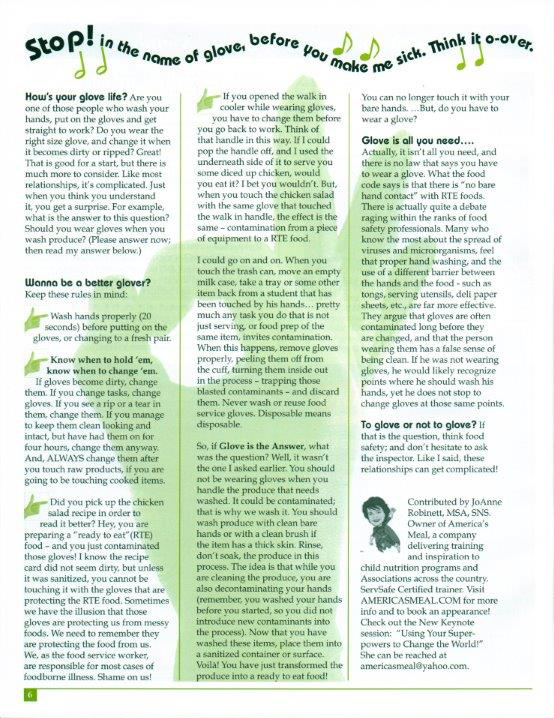 To glove or not to glove? If that is the question, think food safety; and don’t hesitate to ask the inspector. Like I said, these relationships can get complicated!